A violin typically consists of a spruce top (also known as the top plate or belly), maple ribs and back, a neck, a bridge, four strings, and various fittings including a chinrest, usually attached to the left of the tailpiece. Distinctive features of the violin body shape are its hourglass-like shape providing clearance for the bow at the waist and the arching of its belly and back to create a resonating soundbox to amplify the sound of the strings. The voice of a violin depends on its shape, the qualities of the wood it is made from, the thickness profile of both the belly and back, and the varnish that coats its surface. Spruce is chosen for its lightness, strength and flexibility and maple for its hardness and beauty. The neck is usually maple with a flamed figure similar to that of the ribs and back. Attached to the neck is the fingerboard, typically made of ebony, but on student instruments sometimes another wood is used and stained or painted black. Ebony is the much preferred material because of its hardness, beauty, and superior resistance to wear. Fingerboards are designed with a particular convex curve that matches the curve of the bridge. The bridge is a precisely cut piece of maple that the strings are stretched over. It is not attached to the belly of the violin, but is able to move freely as it transmits the vibration of the strings down into the body of the instrument. Its top curve holds the strings at the proper height from the fingerboard in an arc, allowing each to be sounded separately by the bow. Inside the instrument, the sound post fits precisely between the belly and the back, again not attached to either. It sits directly below the E-string foot of the bridge and supports the pressure of the strings down onto the instrument. The sound post also transmits vibrations between the top and the back of the instrument. Behind the bridge, the tailpiece holds the ends of the strings and is itself anchored to the lower bout of the violin by means of the tailgut, which loops around an ebony button called the tailpin or endpin. Attached to the tailpiece are fine tuners allowing for very precise adjustment of the pitch of the strings. On professional instruments only the highest string will have a fine tuner, but on student instruments all four strings will have fine tuners and they are often built directly into the tailpiece. 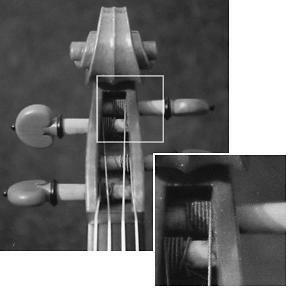 At the scroll end of the violin, the strings travel into the pegbox and are wound around the pegs. Strings usually have a colored silk wrapping at both ends, for identification. The Quinn Violin site has a handy reference guide to these ID colors. The strings should be wound from the center of the peg towards the edge of the pegbox as shown to the left. The tapered pegs allow friction to be increased or decreased by the player applying appropriate pressure inward towards the pegbox along the axis of the peg while turning it. Without the right amount of inward pressure as the pegs are turned, they will often slip back again, releasing the tension of the strings. When tuning using the pegs, care needs to be taken that the strings are not over-tightened as this can result in a broken string. To ensure the correct tension is not exceeded, the strings should always be plucked or played as the peg is turned so that the ear can provide feedback as the string approaches the correct tension.